On a blustery Sunday afternoon this February, 160 Jones High School students were handed the hottest tickets in town as SunTrust and the Dr. Phillips Center invited them to attend one of the final performances of Hamilton. LIFT Orlando asked one of those students, Nubia Tillman, to share her experience with us and she was kind enough to honor us with her gifts in writing. Take a look at her valuable perspective and see Hamilton through her eyes. As a student of Jones High School, I was given the opportunity to go with a group of other students to the showing of Hamilton. In case you are unfamiliar with the piece, the show is a play by play of Alexander Hamilton's journey to success and how his life ended at the hands of a former friend then later enemy, Aaron Burr, during a gun duel between the two. My personal opinion of the show, was that it was beautifully done. The musical aspect was my favorite part because I have always been interested in theater, more specifically musical theater. My favorite song was “Room Where It Happens”, the reason being the instrumental version of the song just gives me chills. Also, it shows the jealousy that most people feel when they aren't apart of the conversations that makes changes. I first hand have experienced that feeling and that jealousy leads to a different type of anger. And in the show the audience can see that change first hand in Aaron Burr, a fascinating aspect to his character throughout the play. The historical aspect of the play also intrigued me because history has always been my favorite subject. To learn how similar Alexander Hamilton was to people of color is what really shocked me. The main reason for that is because when you talk about American history, it is rare to hear about someone of color, such as Hamilton, do something so important. The historical part also bothered me the most because it made me wonder why this wasn't taught in school. For someone to be so impactful, to not be taught about until recently is hurtful. Questions came to me after the showing on whether or not it was because racial intentions, but as a student that appreciates history, I felt as if I was lied to because of the lack of information on Hamilton in history textbooks. However, it allowed my generation to understand history and in a way get excited about learning about history. Since the play was hip hop based it really made me also appreciate the craft of hip hop and how it could relate two completely different subjects and make it easy to digest. As a young African American female, who aspires to write, I see myself in Hamilton, just for the fact of when he would encounter issues, his only way out was through writing and I am like that. The play also gave me motivation to do more with my life knowing that I am about to graduate high school and become an actual adult. Since Hamilton, like a lot of students in Jones and majority of high schools, come from difficult backgrounds, it made me think if he could make something out of himself, then so can I. I can easily say that this is an experience that I will never forget, not only for the purpose of just see a play in person, but also the long lasting impression Hamilton has left on me to not “waste my shot”. My name is Nubia Tillman and I am 18 years old. Currently I attend Jones High school and I am in the 12th grade, along with being in the IB program. I plan to attend Clark Atlanta University and major in Mass Media and Communications. Something that interests me is astrology, meditation, and how those two things can help understanding a person. 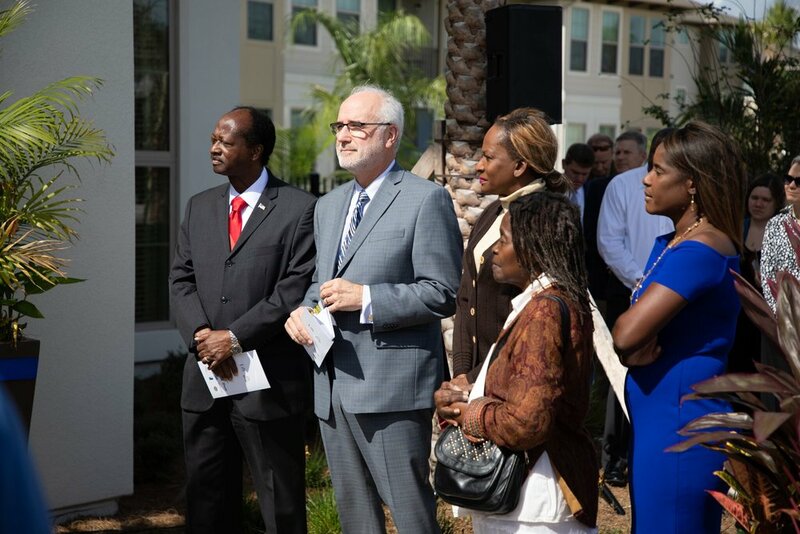 A year after its grand opening, Pendana continues to make dreams come true for Orlando residents in need of affordable housing. Recently Spectrum News 13 paid a visit to Pendana to hear one woman’s gratitude at finally finding a place to call home. This fall, eight food entrepreneurs joined forces as a part of the inaugural West Lakes Food Business Accelerator. 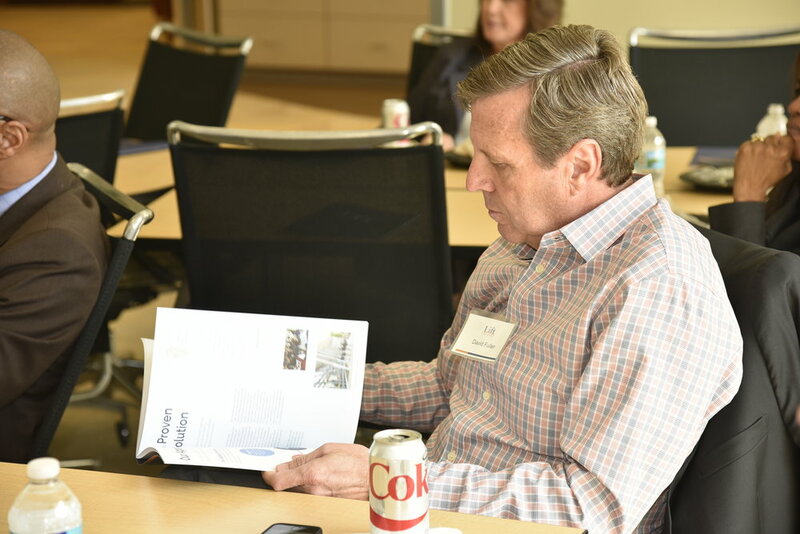 The food businesses that participated in the cohort included The Union, Food Trucks in the City, Nikki's Place Inc., Oley's Yummy Kitchen, Orlando Coffee Roasters, Orlando City Deli, and Hebni Nutrition Consultants. With a focus on growth, community, and overall excellence, these business owners committed to weekly gatherings designed to improve their services. We are pleased to announce a $1.2 million grant from the SunTrust Foundation spread over three years to establish the SunTrust Financial Well-Being Center at the Communities of West Lakes. The center will offer residents a wide range of support services to help them gain financial confidence. The SunTrust Financial Well-Being Center will initially be located at the HUB, the current office space for LIFT Orlando. The center will offer age-appropriate financial education and financial counseling services such as budgeting, saving, credit repair and homeownership, as well as employment services. Through a partnership with Goodwill Industries of Central Florida, two dedicated employees will staff the SunTrust Financial Well-Being Center. They will schedule classes, workshops, events and one-on-one meetings with financial well-being advisors for residents in addition to promoting the center’s services. The new center is estimated to provide financial workshops and services for more than 350 residents annually to help stimulate and strengthen the neighborhood economy. 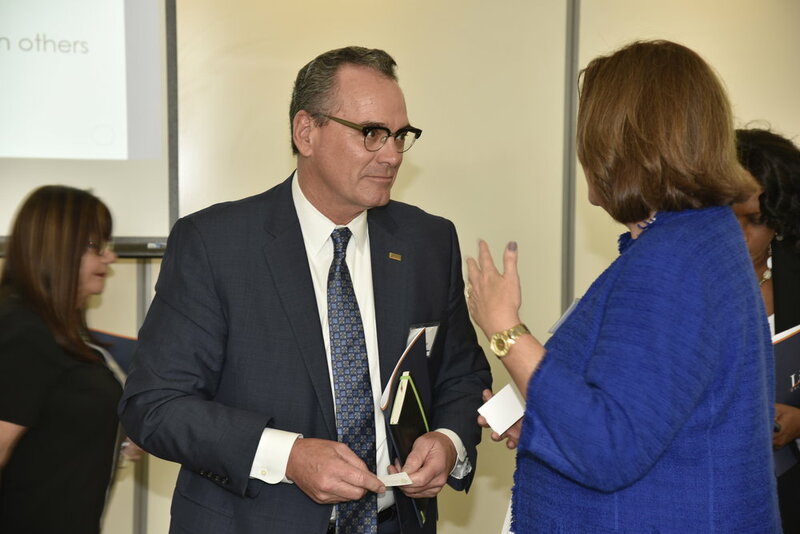 “We’re proud to partner with LIFT Orlando to reach more people in the community with financial counseling and education to further strengthen their financial well-being,” said Scott Cathcart, SunTrust Bank Florida division president, speaking on behalf of the SunTrust Foundation. 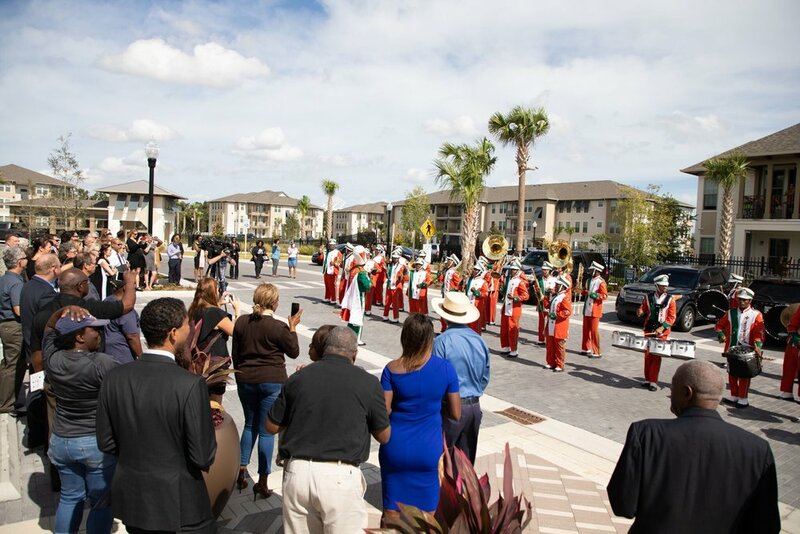 We joined our Atlanta-based housing partner, Columbia Residential, to host a grand opening and ribbon cutting ceremony yesterday at Pendana at West Lakes which began with a marching in and performance by the Jones High School Marching Band. The event was attended by more than 80 people including West Lakes residents, elected officials, project partners and community leaders officially opening the 200-unit, $40M mixed-income development that reached full occupancy in August. “This day is truly a dream come true for our community,” said Eddy Moratin, our Executive Director. “The completion of construction and full occupancy of Pendana at West Lakes is a big milestone in our shared effort to strengthen the Communities of West Lakes,” continued Moratin. Pendana at West Lakes is located at 2023 Orange Center Boulevard, which is the former site of the Washington Shores Apartments. The development features high quality and beautifully appointed 1-, 2-, and 3-bedroom apartment residences in several configurations including flats and townhomes spread across 12 buildings. Every residence features grand 8-foot entrances leading into living and bedroom spaces with soaring 9-foot ceilings in addition to 42-inch cabinets in the kitchens and ceiling fans in every room. Pendana at West Lakes was built to the National Green Building Standards that includes incorporating lower energy use through LED light fixtures and efficient HVAC systems. Also, all residences across the development utilize water sense certified plumbing fixtures for efficient use of water and the majority of materials used to build the development were sourced within a 500-mile radius ensuring a reduced environmental footprint. Welcome Noel Khalil, Founder and Chairman of Columbia Residential, one of the leaders in the southeast for mixed income housing, inspires the crowd. “This is a magnificent day for West Lakes and the many wonderful long time residents in our community,” said Mrs. Shirley Bradley, West Lakes Partnership Board Member. “Pendana at West Lakes is just beautiful and I am grateful that it is a centerpiece development in our community and now home to both former, current and new residents,” continued Bradley. Resident leaders are ready to cut the ribbon! 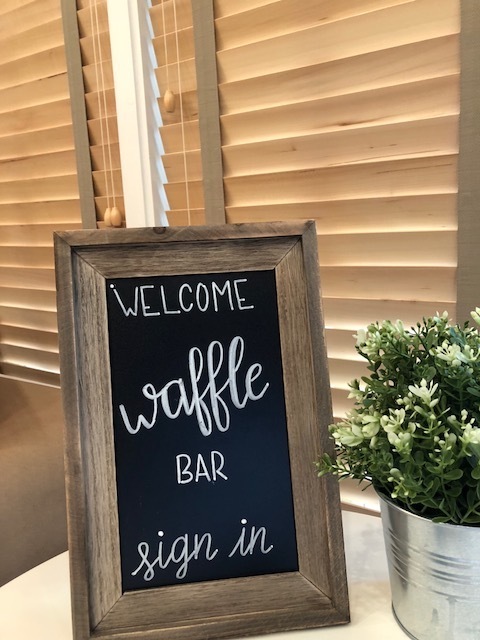 The grand opening of Pendana at West Lakes falls on the heels of the October 17th groundbreaking event for the adjacent Pendana at West Lakes Senior Residences attended by more than 120 people. The development located at 2205 Orange Center Boulevard will offer 120 all-affordable 1-, and 2-bedroom senior apartment residences in an expansive three-story building and is slated for completion at the end of 2019. Wayne Densch Charities has committed a $1 Million investment into the Communities of West Lakes. The gift will be used to advance LIFT Orlando’s plans for health and wellness through creating aspirational environments for children, families and seniors to thrive together and grow as a healthy community. Pendana, the newest housing development in West Lakes, has generated excitement since it opened in 2018. Located less than a mile south of Camping World Stadium, Pendana is offering beautiful and affordable apartment homes, rich with amenities for its residents. 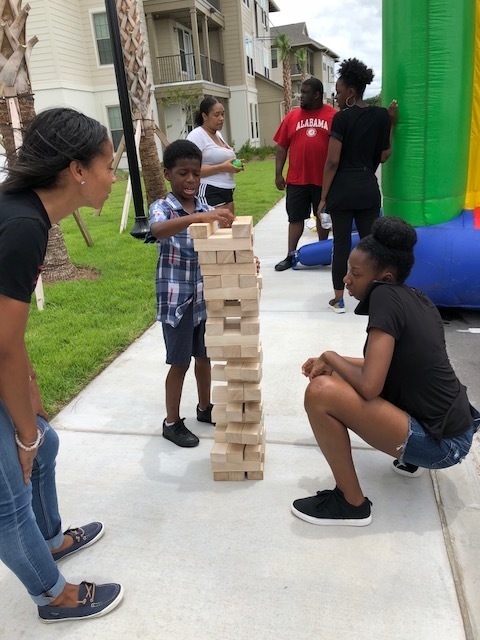 We are proud to see how the community of Pendana is coming together for neighborhood barbecue gatherings and informal friendly dinners since moving in (see photo gallery below with photos courtesy of Christian Ruark). There are currently over ninety Pendana residents with new move-ins occurring every week! Construction of Phase I of this development is scheduled to be complete in August of 2018 (but that date is subject to change). Due to the overwhelming positive response from the West Lakes Community and Orlando area, there are now more submitted applications than remaining apartment units available. As a result, Columbia Residential has suspended taking any additional residential applications for Pendana at West Lakes at this time. For those still interested, the property staff will provide assistance with completing an interest card to collect contact information and the desired unit type. If units become available in the future, the staff will contact those still interested to make an appointment to submit an application. For those who have already submitted an application, they will continue to process them until all units have been leased. In addition, we look forward to a Ribbon Cutting Celebration of Pendana as Phase I comes to close in August! Announcing A New Early Learning Center in West Lakes! Mrs. Naomi Robinson Bassa is a person who shone on a daily basis and consistently allowed her light to be radiated to those she served and interacted with. She resided in the Rock Lake neighborhood, where she had lived since 1996. She was actively involved with her homeowners association and also served as their Neighborhood Watch president. Mrs. Bassa was raised in a family in which she had nineteen siblings. They farmed pigs and cows and grew various crops of vegetables, such as peas and potatoes. At an early age, she learned to function within a team environment, to love people, resolve conflict, and to accept others as they are. She birthed ten children of her own, three of whom have passed on. She had a genuine love for children and helped raise several more who often came to her by way of unfortunate circumstances, including the eighteen-year-old she raised since he was one. She was the neighborhood baby-sitter, dropping off and picking up children attending Rock Lake Elementary when their parents were unable to. To avoid possible criminal activity, she would take her neighbors trash cans from the curb when they were away from home. Mrs. Bassa continued to utilize those early acquired skills as part of a team of Chaplains at the Orange County Jail and at the Michigan Street Work Release Center. She ministered to inmates and officers alike, and was often affectionately referred to as ‘Ma 8.’ She would pray, encourage, listen, and her message to all was "Let your mess be a message and let your test be a testimony." She pastored for many years and was the Senior Pastor of God's House of Worship, which was first formed as a Bible Study in her home with former inmates who wanted to continue studying with her. When they had nowhere to go upon release, she, at times, opened up her home to give them the basic need of housing and other necessities. She gave clothes to those in need. When Mrs. Bassa had free time, she enjoyed gardening and mowing her lawn, cooking and working her part-time catering business. She was undeniably passionate about helping people and selflessly served her community using her gifts and talents. Mrs. Bassa was a Godly woman, and a great family and community leader. She will be greatly missed. Partnership with Florida Citrus Sports helps to create new traditions for Central Florida’s future. As one of LIFT Orlando’s most valuable partners, Florida Citrus Sports (FCS) is helping to engage our residents and the greater community by creating relationships and new traditions. It’s due to our partnership with FCS that we’re able to expand our reach further, and in more impactful ways than we imagined. This month, FCS led several initiatives designed to support our shared goals and create a sense of community and building the neighborhood, in more ways than one. As a part of the College Football Playoff Foundation and their Extra Yard for Teachers Initiatives, eight local teachers were recognized on the field during the first quarter of the Camping World Kickoff game on Labor Day for their efforts and dedication to the children of the West Lakes community. These teachers included Toshia Blake and Sarah Lander from Orange Center Elementary, Sheena Garth-Clayton and Kristyn Newman from Legends Academy, Linda Benett and Jessica Thompson from Frontline Outreach, and William Bolt and Jessica Clark from Jones High School. We thank the College Football Playoff Foundation, which seeks to elevate the teaching profession by inspiring and empowering quality teachers, for our local inclusion in this program and for recognizing our amazing local teachers! In addition to the teacher recognition, in early October, FCS, LIFT Orlando, CNL, and Jones High School Boosters partnered to establish the Inaugural Legacy Classic – a newly-formed friendly football series at Camping World Stadium. The first game rejuvenated the old “Soul Bowl” rivalry between Jones High School and Evans High School. During the game, Jones High School honored its 1960 and 1961 football teams, which were the first in school history to finish the season undefeated. The recognitions and Legacy Classic are two examples of the work that LIFT be a part of, thanks to partners like FCS. We thank you FCS! LIFT partner - Frontline Outreach - featured in 32nd Annual EMCOR Services MSI Golf Benefit. 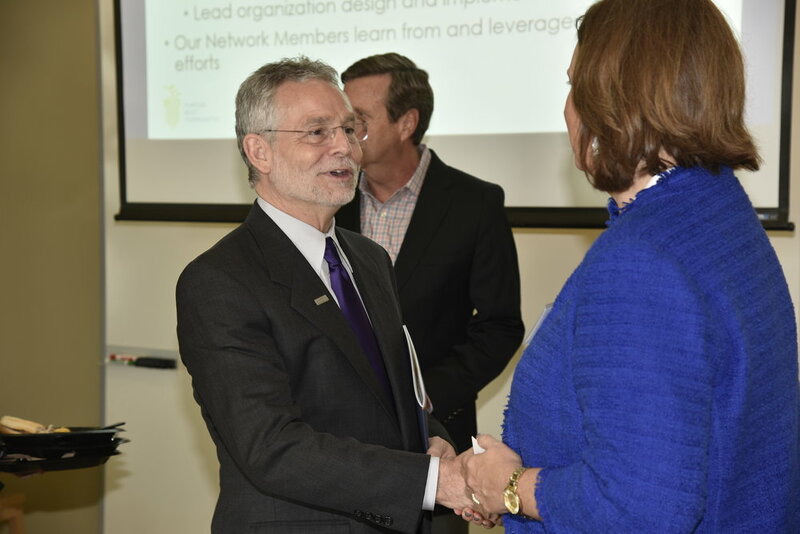 We partner with best-in-class nonprofit partners and local businesses to help accelerate community transformation. Frontline Outreach is one of those quiet and amazing partners, and local EMCOR Services MSI is a business who helps support the good work Frontline does, including providing educational and leadership programs for urban youth and their families here in Orlando. EMCOR Services MSI’s 32nd Annual Golf Benefit for Frontline Outreach is coming up on Friday, October 21, 2016. Bill Dillard with EMCOR Services MSI shared that, “Support of Frontline Outreach has tremendous potential. To equip a child with a strong foundation in early education, an understanding of accountability, and a strong sense of purpose can provide a better path to personal success.” And we couldn’t agree more. Details are below. If you’re interested in getting involved for a great cause, visit the event’s web site. Sponsorships are available. The organizations, both Frontline Outreach and EMCOR Services MSI, are hoping to fill both courses this year. Golfers will enjoy refreshments and camaraderie for a great cause. For more information, visit the event’s web site. 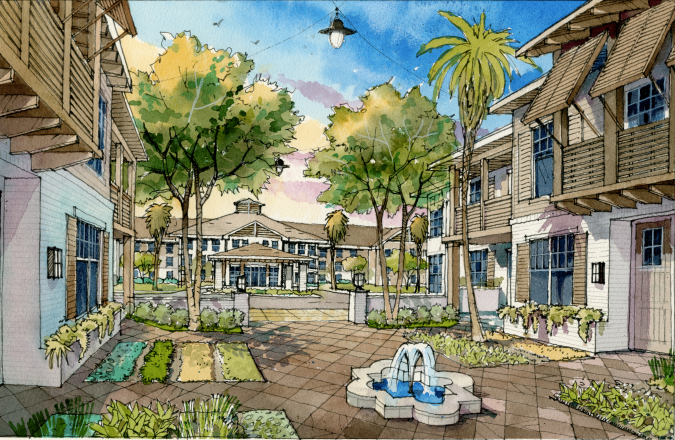 (Orlando, Fla.) June 2, 2016 – Representatives of LIFT Orlando, the City of Orlando, Columbia Residential and Winter Park Construction will hold an informational meeting for subcontractors interested in the West Lakes Village project on June 6, 2016. The event, being held at the Holden Heights Community Center, is being hosted by Samuel B. Ings, the Orlando city council commissioner for District 6. Registration for the contractor outreach event begins at 7:30 a.m., with the program scheduled to begin at 8:00 a.m. Minority-owned, women-owned and businesses that fall under Section 3 requirements of the U.S. Department of Housing and Urban Development are needed for this project and strongly encouraged to attend. The West Lakes Village project is comprised of approximately 15 acres along Orange Center Boulevard in Washington Square, near downtown. The revitalization project calls for 200 mixed-income multifamily units and 120 seniors housing units, with the development to be completed in two phases. Founded in 2012, LIFT Orlando is a nonprofit organization founded by business leaders in Orlando, Florida, to partner with residents and break the cycle of poverty through holistic neighborhood revitalization focused around mixed-income housing, cradle-to-career education, community health and wellness, and long-term economic viability. For more information, visit LiftOrlando.org. We are so grateful for all those who participated in last week's Demolition Kickoff event. This event is meaningful because it is the first public evidence of the transformation that is to come to the Communities of West Lakes. The residents on the West Lakes Council representing the neighborhoods near the Citrus Bowl surrounding Rock Lake, Lake Lorna Doone, Lake Sunset and Clear Lake have provided tremendous leadership to a process of partnership that has given us the strength and confidence to make it this far in a spirit of collaboration. There is still so much work ahead and as we stop to celebrate a major milestone and thank the long list of partners that have brought us this far, we also endeavor to continue to earn the trust of those whose futures are directly impacted by these holistic investments in neighborhood transformation. Click here to view the video and picture gallery of the event.